Featured amenities include a 24-hour front desk, ATM/banking services, and a vending machine. Free self parking is available onsite. Make yourself at home in one of the 79 air-conditioned guestrooms. Complimentary wired and wireless Internet access keeps you connected, and cable programming provides entertainment. Private bathrooms with shower/tub combinations feature complimentary toiletries and hair dryers. Conveniences include safes and desks, and housekeeping is provided daily. Make yourself at home in one of the 84 air-conditioned rooms featuring refrigerators and LCD televisions. Your pillowtop bed comes with premium bedding, and all rooms are furnished with sofa beds. Satellite programming and iPod docking stations are provided for your entertainment, while complimentary wireless Internet access keeps you connected. Private bathrooms with shower/tub combinations feature complimentary toiletries and hair dryers. A stay at Centennial Hotel Spokane places you in the heart of Spokane, within a 10-minute walk of Spokane Arena and Riverfront Park. 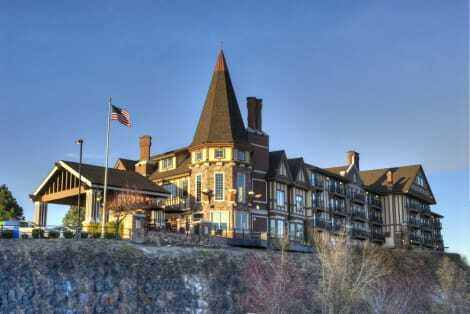 This hotel is 0.5 mi (0.8 km) from INB Performing Arts Center and 0.5 mi (0.8 km) from Spokane Convention Center. Make yourself at home in one of the 375 air-conditioned rooms featuring refrigerators and flat-screen televisions. Complimentary wired and wireless Internet access keeps you connected, and cable programming provides entertainment. Private bathrooms have complimentary toiletries and hair dryers. Conveniences include phones, as well as desks and coffee/tea makers. Make yourself at home in one of the 149 air-conditioned rooms featuring LCD televisions. Your pillowtop bed comes with down comforters and premium bedding. Complimentary wireless Internet access is available to keep you connected. Conveniences include phones, as well as safes and desks. Located in Spokane, Holiday Inn Spokane Airport is within a 15-minute drive of Spokane Arena and Northern Quest Casino. This hotel is 3.9 mi (6.3 km) from Knitting Factory and 4.6 mi (7.3 km) from INB Performing Arts Center. Satisfy your appetite for lunch or dinner at Great American Grill, a restaurant which specializes in American cuisine, or stay in and take advantage of the room service (during limited hours). Wrap up your day with a drink at the bar/lounge. Cooked-to-order breakfasts are available daily for a fee. lastminute.com has a fantastic range of hotels in Spokane, with everything from cheap hotels to luxurious five star accommodation available. We like to live up to our last minute name so remember you can book any one of our excellent Spokane hotels up until midnight and stay the same night.